This premium digital bulletin located 9 miles outside of Boston, is situated on Rte 93 at the intersection of Rte 128 in Stoneham/Woburn, Massachusetts. 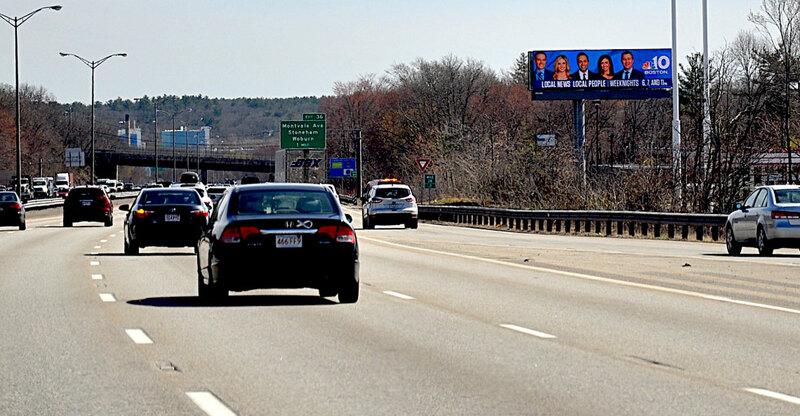 Rte 93 feeds the upscale Middlesex County communities as well as New Hampshire commuters and tourists, delivering a diverse and high circulation audience. Strategically located just before Rte 128, “America’s High Tech Highway,” which encircles Boston and is home to IROBOT, EMC, Hubspot,Trip Advisor and Constant Contact. Also IBM, Facebook,Twitter, GE and WayFair have major corporate of ces in the area. The New Hampshire and Vermont vacationers are a desirable target group that this high profile unit reaches year round.